must start with the One who made her." We were created to glorify God. He is the Source of our existence and we have no life apart from him. Yet we live in a self-centered world. Its seductive pull beckons us to "fit in." We crave the acceptance and approval of others, and young women especially, find themselves insecure, not realizing where their worth is found. Though the world whispers that outward beauty is all-important, a Christian woman knows self-glorification will never fulfill her. She knows there is a longing in her heart that only Christ can remedy. A Christian woman strives to live a God-centered life. She embraces the purpose for which she was created--to magnify the name of Jesus and adorn the message of the gospel. This is her reason for living. As the mini skirts get tinier and the necklines plummet to new depths, what does a Christian woman do? She lives intentionally. She adorns herself intentionally. She's willing to make personal sacrifices, at the expense of her vanity, not constantly asking, "What will make me happy?" Rather, she wants to know: "What will please you, Lord? What will display your glory?" I pray that through this ebook, you will be challenged to think through your heart motivations and how you view your appearance, as well as your choices of outward adornment. I pray that you will find your fulfillment not in your own fleeting beauty or the attention you may receive because of it, but in the person of the Lord Jesus Christ. I pray you will dress for Someone greater than yourself, striving to surrender your heart to Him daily. 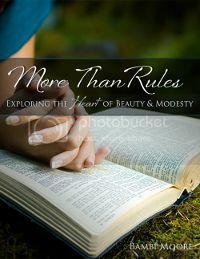 "More Than Rules is, hands down, the best work I have ever read on modesty. 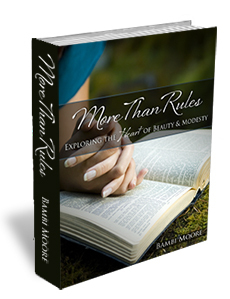 In typical Bambi Moore style, More Than Rules delivers a timely and convicting message with humility and humor. Though generally a divisive topic among Christian women, Bambi breaks through barriers of legalism and antinomianism and presents a biblical doctrine with grace and kindness that will ultimately lead others to contentment with who they are in Christ. It's an affirming and encouraging read for those who sometimes feel like living in the modesty trench is a losing battle, and for anyone just curious about what it means to be modest, consider More Than Rules your ticket to a whole new wardrobe! " "We try to recognize when we are swinging and temper it with the Word of God which is always healthy and balanced. I can safely recommend Bambi’s book as a balanced resource on this subject. Read it with your daughters. You’ll have much to discuss." "My favorite chapter? Chapter 10, "Read Any Good Looks Lately?" Bambi addresses well the issue of "arriving" at modesty. Her claim that we won't ever arrive, as in eliminating the need to examine our wardrobe and our hearts, but will constantly have to battle the temptations of the culture and our own sinfulness, is a good one and very insightful."